I will be featuring my most recent works as well as some of the earlier ones on December 1-2, noon-6 pm. Over 50 artists will be participating in this event. 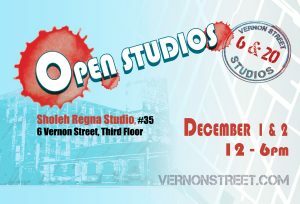 Hope to see you there, 6 Vernon Street, third floor, studio #35.